The Cumberland & Dumfriesshire Farmers Mart P.L.C. 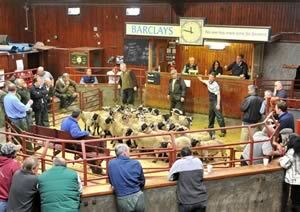 had forward 49 prime cattle, 40 over thirty month cattle, 5,455 prime lambs and 6,931 cast ewes & rams at their weekly sale at Longtown on Thursday 30th September, 2010. Prime cattle saw handy weight heifers selling to a fast trade with smart Limousin heifers topping at 179.5p from GP & EA Coates, Beckhall and purchased by Border Meats, Butchers, Lockerbie. Others to 162.5p Beckhall, 157.5p Justicetown; Angus 157.5p Townfoot. Top price per head £1036.35 for a Charolais from Sceughdyke. Continental bullocks to 177.5p from D & E Lockhart, Faulding Cleugh and purchased by W Kirkup & Son, Butchers, Longtown; Limousin 159.5p Faulding Cleugh, 155.5p Newby Farm. Top price per head £1100.50 for Limousin from Faulding Cleugh. OTMs to 121.5p for Limousin for High House, 117.5p Kildaloig, 101.5p Burnside; Friesian 87.5p Peterscrook; Galloway 85.5p Hardhurst, 80p Moorend; Bluegrey 85.5p Moorend; British Blue 103.5p Blindhillbush, 99.5p Knarr & low Peninver; Angus 101.5p Kildaloig. OTM steers to 114.5p for Limousin from Townfoot; OTM heifers 101.5p for Friesian from Hethermill. A large show of 5,455 lambs presented to the usual ring of buyers. Lambs were a similar trade to last week averaging 152.3p/kg but the problem was too many heavy and fat lambs 44-48kg were forward. The sale topped at £88.50 for Beltex from Balgray and 197p/kg from the same. Other Beltex to £84.50 Balgray Hill, £73.20 Winterhope; Suffolk x £77.20 Faugh Beeches, £76.80 Sceughdyke, Tinnis Hall & Leaona Villa; £75.80 Roanstree; Cheviot £63.80 Chapel, £61.50 Girnwood, £61.20 Sorbietrees; Texel £86.50 Little Orton, £86.50, £79.50 Carran Farm; Bleu de Maine £64.20 Henrys Hill, £62.50 East Mains; Charollais £69.80, £67.20 Leaona Villa, £60.50 Lanehead; Halfbred £65.80, £64.20 Adderston Shiel; Greyfaces £68.80 Englishtown, £68.20 Thornship, £67.50 Westernhopeburn; Leicester £61.50 Plumpe; Blackface £64.80 Hesleywell, £63.50 Gall, £62.80 Lanehead & Gall; North Country Cheviot £68.20 Thornship; Swaledale £54.50 Waterloo; Herdwick £64.50 Waterloo; LLynn £63.80 Whiteclose; Oxford £61.50 Guards Farm; Easycare £69.50 Glenapp, £62.80 East Fortissat Farm, £62.50 Glenapp. Lightweight lambs to £59.80 for Texels from Haymont, £55.80 Killean, £54.50 Patties Hill; Suffolk x £55 Haymont, £54.80 Coytre; Cheviot £54.80 Commonside, £53.20 Haithwaite; Bleu de Maine £50.20 East Mains; Greyface £55.80 Newington, £51.20 East Fortissat; Blackface £55.20 Syart, £53.80 Riskinhope, £49.80 Riskinhope; North Country Cheviot £52.20 Killean; Swaledale £44.20 Low Roughhill; Herdwick £42.80 Haithwaite; Easycare £52.30 Haymont & East Fortissat. Another monster show of ewes and rams were forward to a full ring of buyers with trade firmer on the week, especially for heavy and well fleshed ewes. Plainer ewes harder to sell. The sale topped at £172.50 for Texel rams from Crumhaughhill, others £132.50 Stotsfold, £128.50 Crumhaughill; Suffolk x £138.50 Blackhaugh, £98.50 Kirkland Green; Cheviot £108.50 Gall Farm; Charollais £118.50 Bordergate; Blackface £84.50 Syart, £73.50 Pond Farm; North Country Cheviot £120.50 Folley, Jacob £66.50 Easthouse; Beltex £88.50 Netherside, £78.50 Unity; Woodland £98.50 Wool Hall; Oxford £106.50 Severs; Dorset £98.50 Wool Hall; Easycare £88.50 Blackhaugh. Heavy ewes to £126.50 for Texels from Westhouse, others £124.50 Roadside, £122.50 Severs; Suffolk x £106.50 Severs, £104.50 Sockbridge, £102.50 Roadside & Easthouse; Charollais £106.50 Wool Hall, £98.50 Severs, £96.50 Severs & Roadside; Halfbreds £86.50 Broomhillbank; Greyface £83.50 Wellington Farm, £82.50 The Nook, £81.50 Whinfield; Cheviot Mules £90 The Nook, £84.50 Muircleugh, £80.50 Hassendean; Leicester £86.50 Chipping; North Country Cheviot £93.50 Sockbridge, £90.50 Crosskirk, £89.50 Roadside; Beltex £97.50 Mouldy Hills, £84.50 Winterhope; Zwartbles £86.50 Alton; Lleyn £68.50 Plump & Easthouse, £67.50 Guards; Oxford £88.50 Easthouse & Riverside Lodge; Easycare £67.50 Blackhaugh. Light ewes to £87.50 for Cheviots from Balgray Hill, £84.50 Stackbraes, £80.50 Dinley; Blackface £57.50 Longyester, £55.50 Gall & The Nook, £53.50 Easthouse; Swaledales £54.50 Clarks Hill, Kirkland Green & Kilnstown, £53.50 Round Meadows; Herdwicks £35.50 Waterloo, £32.50 Home Farm; Jacob £40.50 The Nook.